Kevin and I had the pleasure of photographing Meredith and Matthew’s wedding at Butlers Courtyard in League City two weeks ago. It was beautiful day all around and ended with Meredith and Matthew leaving in a 1930 Ford Model A Coupe as their exit! I hope you enjoy some of our favorite moments from their wedding day. Catherine and Chad had a rockin’ New Years Eve wedding and everyone was dressed in their swankiest 1920’s attire. The beautiful ceremony and reception were at the Scottish Rite Temple in downtown Galveston and all the guests were putting on the ritz! Happy New Year 2016! Cat and Chad got married in a rocking ceremony Thursday night so I’m happy that I can finally share their engagement and bridal portraits I shot in 2015. They had a fabulous 1920’s theme as you’ll see and I will post a sneak peek of their wedding soon. Kevin made a fun animated GIF of the streamer explosion at Alyse & Jonathan’s wedding! I photographed Mandi’s bridal portraits in March and now that she is Mrs. Aaron Griffin I can finally share them with you! Sara and Cody were married last Saturday at The Lyceum of Galveston Island. They should be back from their honeymoon today so I can finally share her beautiful bridal portraits I shot in April! I want to congratulate all my seniors and post some of the photos I haven’t had a chance to share yet! Y’all all had an amazing journey to get to where you are today, I wish only the best for you and your future. You did it! Congratulations on your graduation! Kevin and I shot Jonathan and Shelly’s wedding April 27th at South Shore Harbour Country Club. The wedding turned out amazing despite the severe thunderstorms sweeping across Texas dumping over 7 inches of rain in the Houston area. I am so excited to share Shelly’s bridal portraits! We shot her session at the historic Hotel Galvez as well as Moody Gardens in Galveston. I photographed surfer girl Kamri’s senior portraits yesterday evening in Galveston. 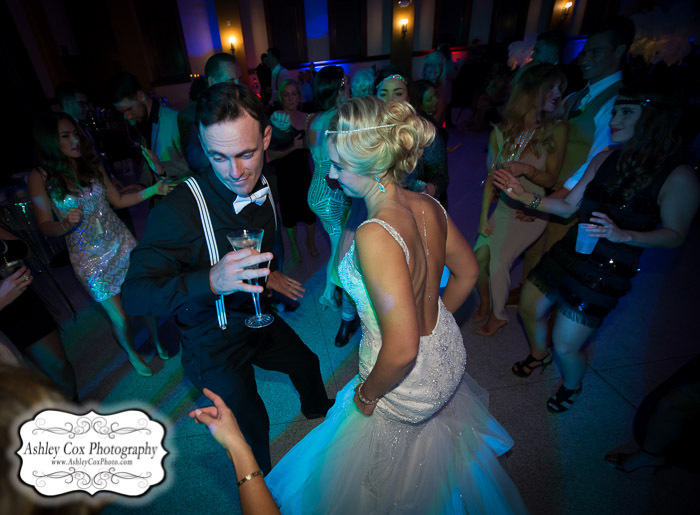 Jamie and Dereck were married in February at Butler’s Courtyard in League City. 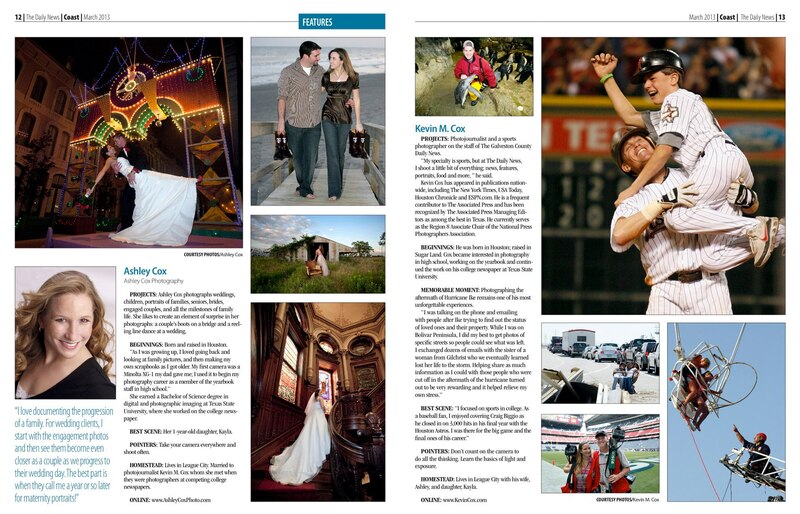 Kevin and I were two of twelve Galveston County photographers featured in the March 2013 issue of Coast Magazine! I spent a beautiful evening with Shelly and Jonathan last week to photograph their engagement portraits. The cold front had just arrived and it was a perfect day for photos at the South Shore Harbour Country Club where they will be getting married next year. I am excited to share this sneak peek of Hannah & Tim’s engagement portraits with you! Amanda and Nathan both love the beach so much they decided to get married on the sand! Sweet little Karis just turned one-year-old and she is as cute as can be! I’m excited I can finally share Tiffany’s bridal portraits with y’all now that her and Max were married yesterday! Here is a sneak peak from Holly and Clinton’s elegant wedding in Galveston. Now that Katie and Justin are married I’m happy to finally share her bridal portraits with you!